Seriously credentialed French officials are proclaiming that a painting found in the attic of a house in Toulouse, France might perhaps, possibly, potentially be a rediscovered masterpiece by Michelangelo Merisi da Caravaggio. And, Sartle being all into art and everything, we think that’s marvelous! Well done, everyone involved. The painting in question is a rendering of the ever-popular story of Judith laying the smackdown on Holofernes. The Old Testament tale paints a dark, desperate time for Israeli. General Holofernes does his darndest to bring God’s independence-loving chosen people under the firm rule of the Babylonian empire. Holofernes’ trail of conquest falters outside Bethulia, Judith’s walled-in hometown. With provisions and time running out for Bethulia, and a Babylonian victory spelling doom for all of Israel, Judith takes matters into her own hands. She shows Holofernes some leg, gets him hella drunk, and then stabs him in the throat until he’s straight-up murdered. This purported vision of the story by Caravaggio has been valued at $135 million. Considering that the discovery was an accident precipitated by the leaking of precipitation into the precipitous point of a home in Toulouse, France, the story seems almost incredible. Let’s just agree to put aside the fact that there isn’t much historical evidence to support this painting’s existence. And, while we’re at it, develop a mutual understanding to ignore all the art professionals dubbing the Caravaggio attribution dubious. Right now, there’s a new painting by an old master that we have to bask under the sun with. Now, since we’re all in such good and rosy moods, let’s take a look back at the best renditions of Judith’s righteous fury that Sartle has to offer. Judith Beheading Holofernes by Caravaggio at the National Gallery of Ancient Art in Rome. This here’s the Judith by Caravaggio we’ve all grown up with. You can really tell that whoever painted the Judith discovered in Toulouse knew a lot about Caravaggio’s work. If Caravaggio didn’t paint this, then it was one helluva Caravaggio fan. I mean, shoot, the depictions of Judith look almost identical. The fun of this work is in all the details. The way blood pumps out of the artery. The mental anguish on Judith’s face. The way her servant is like, “Let me at ‘im, boss!,” with a noggin sack at the ready. Hell, Caravaggio went through the trouble of giving Holofernes grime under his fingernails. A+ for effort, Mike. Judith with the Head of Holofernes by Cristofano Allori at the Pitti Palace in Florence, Italy. Allori used his muse and mistress Maria Mazzafirri as the model for Judith, and his own visage for the slain Babylonian’s loosed noodle. If you’re thinking that says a lot about their relationship, then you deserve a big ol’ gold star. Allori’s relationship with Mazzafirri was one big trainwreck that he never recovered from. While we don’t get the actual assassination, Judith’s calm is unnerving. The ease with which she carries Holofernes’ head makes it appear more like a well-positioned accessory than the aftermath of a ghoulish deed. Judith and Holofernes by Donatello at the Palazzo Vecchio in Florence, Italy. Not a lot of depictions we’ve seen show the wind-up to Holofernes slipping this mortal coil, but Donatello doesn’t disappoint in the moment. There’s no question about the intentions of everyone involved. Where Caravaggio goes for the complications of psychology, Donatello gives us bloodlust. Just look in Judith’s eyes and tell me that wouldn’t scare the bejesus out of you in a dark alley. And with Holofernes, we get to see just how drunk player had to get in order for Judith to do the deed. He’s basically a ragdoll. Honestly, after a night like that, brother’s better off dead. The hangover would have been worse. Portrait of a Lady of the Saxon Court as Judith with the Head of Holofernes by Hans Cranach the Younger at the Legion of Honor in San Francisco, CA. Got to show Bay Pride when we can. This pic’s on display at Big Alma’s pride and joy right this very moment. So, if you’re in the city by the bay, get out there, why doncha? Take a selfie with your head in Holofernes’ place. Have some fun. My favorite part is how whatever lady in the Saxon Court posed for this could not give a single sh*t about hiding even an ounce of disdain. It’s like Cranach finished her face after taking her phone before she could send another Tweet. For real though, awesome hat. People don’t wear enough awesome hats anymore. Judith Beheading Holofernes by Artemisia Gentileschi at the Uffizi Gallery in Florence, Italy. And here’s the big one. 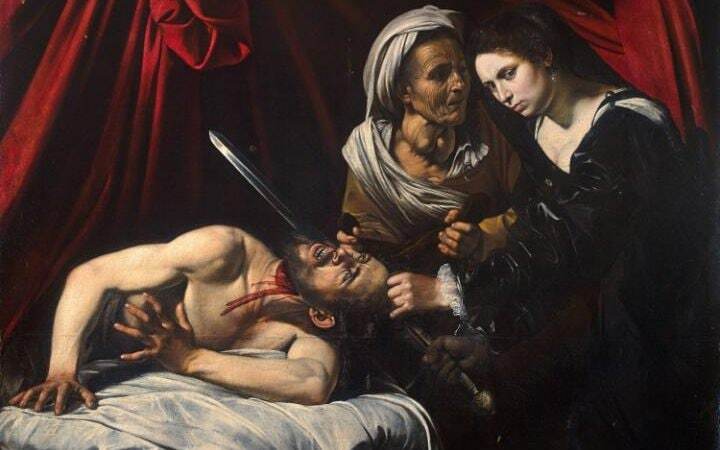 All the paintings of Judith here have something great to offer, but this one really shows what it’s like for a woman to murder one of the baddest, strongest men in the world. Considering Gentileschi’s unfortunate history with powerful men, it’s easy to understand where all these feelings are coming from. None of the other paintings, even the rediscovered Toulouse edition, show Holofernes fighting for his life. Here, we even get to see Judith’s handmaiden getting in on the killing. Also, the blood isn’t just one or two flaccid spurts. This is like the end of every episode of Dexter happening all at once. Judith isn’t scared. She knows what she’s doing. And, unlike the Judith in the Toulouse discovery, she doesn’t care if we’re watching. If we scream, she’s coming for us next.